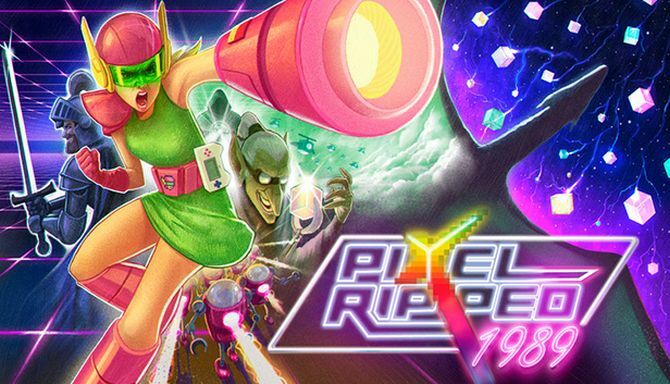 Pixel Ripped 1989 Review – AiPT! A title that’s fun and shows other developers there’s room to grow and do something unique in VR gaming. It’s coming up on two years since the PSVR, Vive and Oculus were released. Developers were quick to release a ton of exclusive and multi-platform games to test the market in case Virtual Reality took off, as many predicted. Unfortunately, this amounted to a bunch of shovel-ware titles that weren’t much more than glorified demos. For VR to be sustainable, there needed to be games that were good and took advantage of the technology to present a game than consumers couldn’t imagine playing any other way. Enter Pixel Ripped 1989, into the fray. Announced before the Oculus was even released, Pixel Ripped had the unique concept of allowing you to play as a character playing a game. It was much hyped, and long delayed, but Pixel Ripped has finally released in North America for the PSVR, Vive and Oculus. Is it Good? Pixel Ripped was conceived by Ana Ribeiro, a Brazilian woman who used to be a baker, but decided she wanted to be a game designer instead. Same old story. Along with a small team of people she met while attending a UK video game development program, she turned the idea of Pixel Ripped 1989 from a class project into a hotly anticipated Virtual Reality game. A failed Kickstarter and a few prospective release dates that weren’t met, slowed down the time frame. However, one of the few games that looked to use the VR medium to give a unique gaming experience, rather than just capitalize off it, maintained it’s strong anticipation among fans. It’s not an easy game to summarize. You take the role of a pixelated hero from a “Ghosts’n Goblins”-esque game that has all the fidelity of an original Game Boy title. You’re “Dot” and the game world you inhabit, “Adventureland”, is under attack by the Cyblin Master, who has taken the Pixel Ripped Stone that holds the soul of “Adventureland”. Except you’re also a school girl named, “Nicola”. She happens to be a gamer who takes her “Game Girl” gaming device with her wherever she goes, including school, to the chagrin of her teachers. Guess what game she happens to be playing? That’s where the inventiveness of Pixel Ripped 1989 begins. As Nicola you spend time in class trying to not get caught playing “Adventureland” by your very strict teacher. Luckily you can arm a spitball shooter and hit various points around the classroom to cause distractions, much like one of those old light gun activated shooting galleries from an amusement park. The distractions are cute and humorous, the best being an out-of-nowhere soccer celebration that had me laugh out loud. Many of the distractions can be repeated after a certain amount of time, and often have to, which would have been much more of a negative if “Adventureland” wasn’t so engaging. There weren’t any shortcuts with the game-within-a-game you play on your handheld device. It doesn’t take long to become challenging, with timed jumps, disappearing platforms you have to memorize, and hidden collectables strewn throughout. The combination of the two games being played is where Pixel Ripped shines and easily lives up to it’s potential. The easily distracted teacher isn’t much of a challenge by herself, but start progressing in Nicola’s handheld game and you might forget about her and it’s game over. As the difficulty of “Adventureland” increases and you’re forced to concentrate for longer periods of time to make jumps and dodge enemies, the stress of timing your distractions to coincide with these stretches is an experience that couldn’t have been pulled off nearly as well outside of VR. On top of these moments, each level in the “real world” of Nicola is topped off with a merging of the two games. The Cyblin Master temporarily escapes the game and makes you confront various challenges that can impact your actual surroundings. Look up from the handheld screen and you might see him flying overhead at recess. In the game world he’s urging dragons to attack and carry away villagers, but look up and around you and you’ll see birds picking up your classmates, flying them up into the sky. You blast away at them with your gaming system, seeing the results in both your world and in the game. The visuals are nice in both worlds, with “Adventureland” appearing in both 2D and 360 VR. The classroom has distraction points hidden behind you that forces you to use the whole environment to find them all. The music is good and I especially like the theme song, which sounds as if it was ripped from an NES era game. The game keeps topping itself as you progress, with the cool ways the developers found to make the two worlds interact. The difficulty of the final boss is a bit of a miss, but the real letdown is the length of the game, which might have spoiled an otherwise nearly perfect package. This is one of my favorite VR games to date. Perhaps the best, if you’re not into the horror theme of the VR version of Resident Evil Biohazard. Not just an “experience”, which is shorthand for demo/cash grab, it’s well thought out and unlike anything you’ve likely played before. It’s not perfect, however. There’s always the debate about whether a game is long enough, with some gamers feeling short-changed and others finding length irrelevant if the product is good enough. I’d have to say Pixel Ripped1989 is too short, with a first run through probably not taking more than 3 hours. Luckily, I feel they priced it appropriately at $24.99, with many other VR releases that weren’t much longer coming out at a $50 or $60 price tag. It’s too bad, because had it been twice as long it would have definitely been on my shortlist for game of the year. This is one of my favorite VR games to date. Inventive game-within-a-game that takes advantage of VR like never before. The 80’s, early 90’s setting hits the right notes and has some great early gaming callbacks. "Adventureland" game is designed very well designed and appropriately challenging; not done as an afterthought. Replayability is good because of collectables, easter eggs. Game length is definite letdown given the quality. The difficulty of the final boss will have you not just throwing your controller, but mailing it to a different country.